Ideas to decorate your wedding arch that are easy to do yourself and that look stunning really help make your wedding venue uniquely yours. An arch is a wonderful idea for a marriage ceremony. It does not matter where your venue is - at the church, at the backyard garden, on the beach, at a garden or park, it adds a point of interest to your ceremony. A wedding arch need not be elaborate but it is a great way to make a statement about you, it could be fun, artistic, natural or very modern and it is a powerful way to "frame" the two of you as you say your wedding vows. A similar metal arch to the one in the top photo is available on Amazon and a really great price at under $30. You can also find lots of cheap arch decorations too if you can't find free ones. You can source cheap ready-made arches in most home stores in the garden department. Choose the style and size that you prefer and make sure the two of you will fit in the arch. It would be disastrous if you find that you won't be able to walk through the arch arm in arm on the wedding day itself. You have to make allowances for the bulk of the wedding arch decorations. Make sure you have a clearance of at least 4 feet. 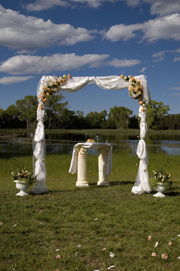 If you want a more elaborate arch you can opt for a chuppah. If this is the case, you can rent or have someone build it for you. If the wedding is at the beach and there are no rentals for wedding arches, improvise with bamboo poles to make a four-footed chuppah. Quite often wedding venues will have an arch which you can use and decorate. If there is another wedding at your venue you may want to see if you can share the decoration costs. 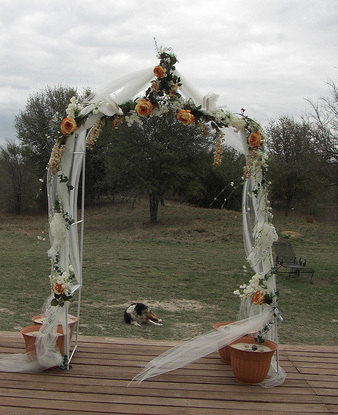 Traditionally a wedding arch decoration would be flowers and yards of organza or tulle. Choose your base of either tulle or organza, tulle is cheaper than organza. Start draping the tulle or organza from the center of the arch down the sides pinning the cloth at each rung of the arch. Make sure you leave an extra tulle or organza at each rung for it to group or pool. Do it at both sides. If the fabric is as wide as the arch, cover the whole arch making sure you secure the tulle or organza at each rung. Add more tulle at the sides in front for a more willowy effect. If you are looking for flowers to decorate your arch take a look at these on Amazon as they are cheap and look great, which is just what we like! Make a bouquet and put it on the top center of the arch. You have the option to use fresh or silk flowers. Add some ivy or ferns for accent. You can also take on a three-point approach of three bouquets - one at the center and two at the sides halfway the height of the arch. You can choose to do away with tulle and just cover the arch's frame with twigs of varying thickness and lengths. You can source the twigs from any flower shop. Secure the twigs on the arch's frame with wire. You can use roses, sunflowers, daisies and gardenias for the accent. Or you can use ferns and ivy for the base and then add flowers all over. Add some baby's breath to soften the look of the greened- arch. Another option is to use palm leaves as base. Cover the whole arch with big white anthuriums and stargazers. The wonderful smell of stargazers will fill the air setting the mood for the wedding. Using fresh flowers might be a bit stressful for a DIY-er bride. Do not be intimated from using silk flowers if you will do the wedding arch decorations. 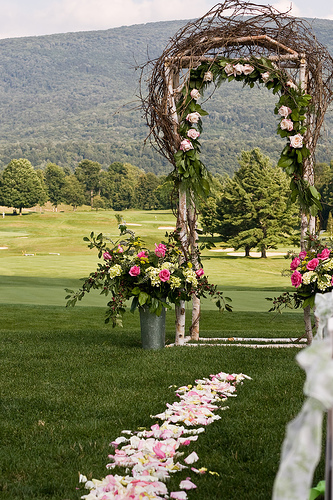 If you prefer fresh flowers, ask or hire someone to "do" the fresh flowers on the wedding day itself.